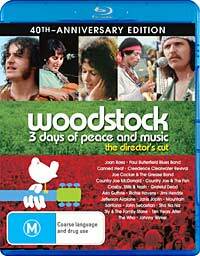 I have just been looking at the second disc of the brilliant 'Ultimate Collector's Edition' Blu-ray version of Woodstock: 3 days of peace and music. One of the extras on this disc is a five minute featurette called 'The Museum at Bethel Woods: The story of the Sixties & Woodstock'. This is presented in 1080i60 format (VC1 encoded), but it doesn't look sharp enough to justify that HD format. I'm 90% sure that it has been upconverted from 480i60. And that the conversion was an astonishingly poor job. Obviously I'm far more familiar with issues of converting 576i50 to 1080i50, so it was startling to see an obvious marker of poor quality of the kind with which I'm familiar. The picture to the right is a full frame (which I shrunk, obviously), with an detail of the frame in the box. That detail was not scaled by me, so that's what you would see on a full high definition display. Notice the horizontal lines near the top and bottom of the characters: that is an artefact of poor deinterlacing and scaling. I see it all the time with cheap high definition set top boxes. They apply a simple bobbing style deinterlacing technique to SD (ie. 576i50) transmissions, then scale the result up to 1080i50, producing those lines. It actually looks somewhat like the Chroma Upsampling Error except that it affects not the colour channels but the luminance one. The picture to the right is from a photo of a display produced by one of those low quality HDTV receivers, upsampling SDTV. There is more on this here, including a picture of how this kind of thing is supposed to look. It seems to appear most commonly when that bobbing deinterlacing is applied to progressive scan material (as still graphics must always be, for course). But that's a cheap consumer-level TV receiver. 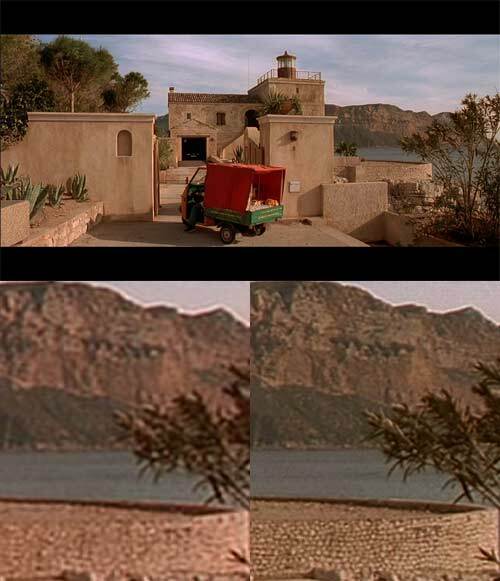 What's surprising is that this should happen on professional level upscaling performance for video release on Blu-ray. And, of course, had this been presented on the disc in 480i60 format, the best of consumer technology -- pretty good stuff these days in a lot of cases -- could have been applied to upscaling the picture. The results would have been better than as delivered on this disc. The video on the disc is irrepairably damaged. Nothing you can do can significantly improve it. I was also present the night John talks of. There is an alternate hypothesis to encoding variations or imagination to explain these perceived differences. Is it possible that physical variations in the disks arising from differences blu ray disk production quality control standards or practices could lead to slight differences which are material for players i.e. which lead to visible differences for the user? I know the "digital is digital" argument regards 1's and 0's but it seems clear that some brand new disks sometimes have playability issues on some players. Could it also be possible that the tiniest variations in physical disks could result in slightly visible differences at the player level? "Bumps in the coating layer do not directly affect the signal quality. However, they may cause optical aberrations that lead to focus and tracking errors." One does not have to understand all the details of this highly technical paper, to get the point that bluray production is FAR more technically demanding than is standard DVD. This is after all new technology. I do hope I am wrong, as the implications are gruesome. I cannot help but wonder whether occasionaly the pressures on increasing yields could cause production houses to drop standards, or whether just natural random variation in the physical disk, even within agreed tolerances, can cause some players to playback ever so slightly differently even the same encode? In any case I agree with you that we need to do further comparisons, on the same gear, blind, to see if any variances can be repeatedly detected. In the mean time, from your knowledge of bluray production and players, do you think this alternative hypothesis i.e. we just happened to strike a "dud" Australian disk, at all possible? This is an interesting theory, but I have strong doubts about it. There are two ways that data reading difficulties could, arguably, feed into performance. One is if the data itself is corrupted as a result, and clearly this could have major implications. This way is not in dispute by anyone, and I will return to it in a moment. A more subtle way that is sometimes raised is that the data ends up not being corrupted, but only because the equipment is working harder at correcting the data. That in itself is said to feed back into the reproduction chain in some way, reducing quality. I've always thought that this latter argument is not very strong at all, since the effects (for example, greater power draw by the processing chips) would be of a magnitude similar to other pseudo-scientific nostrums peddled in the hifi and home theatre arenas (eg. the £500. P.W.B. Quantum Clip). So let us return to corrupted data. There is a major disconnect between the claimed corruption of data drawn from a Blu-ray disc, and the alleged effects on the screen. Intuitively it would seem that, say, the loss of some proportion of the data would translate to the loss of some proportion of the picture, perhaps fine detail or colour fidelity. That's how things work in analogue systems. But modern digital stuff does not work like that. The data on a Blu-ray disc is not an analogue of the original signal. Through the compression systems it has been dismantled and repackaged in a completely different way that lacks all proportion to the original signal. Ultimately those proportions will be restored (more or less, because the compression is lossy), but while the data is being laid down on the disc, while it resides on the disc, and while it is being read from the disc, it has no apparent relationship to the original data, except via advanced mathematical transformations. Misplacing bits beyond the capabilities of the system to correct them will result in quite unpredictable errors. When it comes to reading the disc, a significant number of read errors will cause the signal reconstruction to simply fail. What you will get is not subtle loss of detail, but gross errors such as macro blocking, dropped frames and even total signal loss. That is how Blu-ray (and DVD) signal problems manifest. Not in loss of sharpness, detail, contrast and 'life' in the picture. Hi, while comparing Blu-ray players and HDMI cables last night we (4 of us) discovered while using The Fifth Element Blu-ray as a reference (which we had 2 copies of) that there was a significant difference between them. One of the disks was a American import, the other an Aussie, both were the remastered versions. The American version was clearly sharper, more detailed, better contrast and had just more life to the picture, discussing this further one of the group said this was not the first time he had witnessed this, and went on to say he saw similar improvements on other Blu-rays such as The Dark Knight Region A over the B version . We were using some pretty good gear, and whilst we could see improvements in players and then HDMI cables, the improvement in software was also significant. This is to me terribly frustrating as I do not want to start replacing my Aussie Blu-rays for American ones. Would you be able to find out any info on this if possible please I would really appreciate it. There are several issues here, but I'll start with the last concern: whether John should replace his Australian Blu-ray discs for American ones. The answer is: sometimes. But only if there really is a significant difference, only if it is the US version that is significantly better than the Australian version, and only if he has a player which will work with the US version. If there are significant differences, I would generally expect that to be because the actual encoding of the data is different (different codec, for example, or different video bitrate). That would generally be because different companies have produced the discs for the different parts of the world, so these discs are more likely to be region coded. Obviously, an Oppo BDP-83 Blu-ray player purchased in Australia is likely to be fitted out to play discs from other regions, but few other players can do this. In the specific cases mentioned -- The Fifth Element and The Dark Knight -- the US versions are not region coded. They will play happily in any player in the world. Now let us assume for a moment that the US versions of these two movies do look better than the Australian versions, that does not mean that US Blu-rays in general look better than Australian ones. If the Blu-ray versions of all movies look different in their US and Australian versions, then the default assumption would be that of the ones for which a 'this is better than that' judgement could be made, in roughly half the cases the Australian version would look better than the US version. Consider a gross example: the Australian version of Watchmen comes from Paramount with a much higher bitrate MPEG4 AVC transfer in Australia, than the US Warner Bros VC1 version. However the US version is the longer Director's Cut, so there's a tradeoff. Now we come to the specifics of the claims for these two movies. I have written extensively about The Fifth Element in my review of the Australian version here. I have written extensively about the differences and similarities between this and the two US versions here, finishing it off quite conclusively, I think, here. I believe that in these posts I establish that the video in the Australian version released by Sony and the remastered US version is identical. Having said that, I have been advised by Sony that it has disposed of distributorship, at least in Australia, for this movie. I just checked and this movie does not appear to be available in either DVD or Blu-ray format from any of the major on-line Australian disc retailers (DVD Orchard, EzyDVD, DVD Crave, Atlantic DVD, DVD Downunder, Devoted DVD). So if you want this movie, for the moment you're going to have to buy from overseas. As for The Dark Knight (my review of which is here), I invite readers to compare scans of both the Australian and US versions of this disc which were conducted using the tool BDInfo. These are on the Unofficial Blu-ray Audio and Video Specifications Threads, hosted at the AVS Forum. Those two posts show that both versions of this disc have exactly the same average video bitrate. From my experience with Warner Bros titles, to me that means that these are bit for bit identical copies. I note that the average bitrate for the English language Dolby TrueHD tracks is also identical. So the only difference seems to be the additional streams in the Australian version, adding a number of audio and subtitle languages. So, are there actual visible differences between the US and Australian versions of these two movies? People like me are inclined to say 'No'. If the video streams are identical, then they should be decoded identically on any given player. So I'm inclined to think that the differences John reports are imaginary. It's the same phenomenon that can lead people to think that putting a plain piece of cardboard under one leg of a couch in your listening room can make your system sound better. I suppose that the additional audio and subtitles streams included in the Australian version of The Dark Knight could, in some way, interfere with a player's performance in extracting data from the disc, since there is a bit more of it, but it doesn't seem likely. In any case, it is the US version of The Fifth Element that has the extra audio data, so such an effect should be around the other way with this movie. I have previously received a report of alleged inferior performance of the Australian version of The Fifth Element, so perhaps there is some other version floating around out there. Unless proven, though, I'll stick with the opinion that the differences apparent between the two versions (and, the differences between competent HDMI cables) are imaginary. And I'll remain of that opinion until a well-conducted, statistically significant, double blind trial is conducted showing otherwise, and is successfully repeated a couple of times. Look at the following graph. It shows the frequency balance of a musical section in a 1951 cartoon, 'Symphony in Slang', which appears on the Warner Bros Blu-ray release of An American in Paris. The scale on the right shows the decibel level, while the one on the bottom shows the frequency. Whoops! I cut off the bottom scale! Well, take a guess. What are those divisions? We're talking 1950s here, so don't be too demanding. Here's the answer: the thicker vertical lines mark, from the left, 55 hertz, 110, 220, 440, 880, 1,760, 3,520, 7,040 and 14,080 hertz. That's because of 'The Academy Curve', an audio standard settled upon in 1938 by the Academy of Motion Picture Arts and Sciences. This frequency response restriction was employed to limit the noise from optical soundtracks and was maintained in movies up until the early 1950s. As you can see, the high frequencies above about 5.5kHz are simply not there at all. I used this cartoon, rather than the movie, because in the latter it's clear that some attempt has been made to resurrect its higher frequencies. But had you gone to the cinema back in 1951 to see the movie, Academy Sound is what you would have heard, even for the movie. I plugged in a Samsung BDP-1600 Blu-ray player this evening, whereupon it automatically asked if it could upgrade itself from version 1.0x firmware to 2.04. As is my practice, I told it to go ahead and went and did something else. I don't know what, if anything, the firmware repaired. But when it had finished it had access to You Tube videos. Very clever. Madman Entertainment today sent me the Blu-ray versions of Afro Samurai and Afro Samurai: Resurrection. Both look like they are going to be very interesting. The reason for this Blog post is just to chuckle over an interesting little quirk with the former disc. It is coded Region B, which means it will work in players from Australia and Europe, but not in those from elsewhere The way I check the region coding is by forcing the region code on my computer to Region A, then Region C, and finally Region B. This disc would only play when I set the code to Region B. 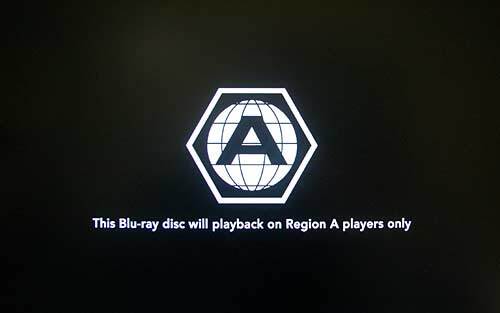 But if it was set to either Region A or C, the graphic above was displayed: 'This Blu-ray disc will playback on Region A players only'. My guess: the disc was prepared in the US for Madman, and the authoring house forgot to change the graphic. Madman would probably never notice, because they'd do all their quality control in a Region B player, so the rejection screen would never appear. Actually, aside from the region coding issue, this disc seems very similar indeed to the US release (which is region coded 'A'). They have the same playlist file name, and the same actual transport stream file names. They use the same video codec and have the same average video bitrate. They both lack subtitles. They also have the same average audio bitrate for their Dolby TrueHD track. Oddly, though, they differ in their two channel Dolby Digital audio track: the US version gets 640kbps while the Australian version gets 448kbps. So just another of those amusing quirks one comes across. No chapter listing is provided with this version of the disc, and the 'Scene Selector' pop up is not all that clear. You can download a PDF of the track listing from my website, from the link on the front page at www.hifi-writer.com. I quite forgot about that, but I remembered this evening, so I've put a link on the front page. The 253kB PDF is here. When printed out, it should slip neatly under the clips inside the Blu-ray case. Perhaps 'the worst book ever written' was actually the second worst. I have experienced every one of these techniques in practice, and can vouch for the effects produced. ... put a small piece of plain paper or card (that is, a piece with no writing or printing on it) under one of the feet of any piece of equipment with an even number of support points. You can use this technique very successfully on audio and video equipment, as well as on larger objects like refrigerators. I achieved marvellous results by putting a piece of plain white card under one foot of my sofa and chairs --visitors have often been amazed when I've demonstrated the effect on the sound produced by removing the card from under my sofa, and they could not see what I was doing. I have this vision. Mr Hughes has some friends or acquaintances or relatives in his living room. He does something out of their sight and enthusiastically proclaims that -- surely!!! -- they can sense the muddiness and sheer lack of tunefulness that his music system now produces, compared to moments before. In the face of his certainty, and his child-like delight, who but a churlish individual such as me could disagree? If you are thinking about giving this technique -- the effect of which Mr Hughes vouches for -- a whirl, do remember to make sure that the card you place under the foot of your sofa or chair does not have any writing on it. No one can say what the effects are if there is indeed some text imprinted on the surface. Permanent damage may result. The first and most obvious [explanation for claims that cables sound different] is that there are differences, and these listeners have the sufficiently acute hearing and refined listening experience to enable them to detect it. This has some unpleasant implications, though. To understand this, you need to accept that a cable cannot improve sound. It is a passive device. At its best, an interconnect cable will transport the sound without any degradation at all. But if it did alter the signal in some way, that alteration must be a degradation. 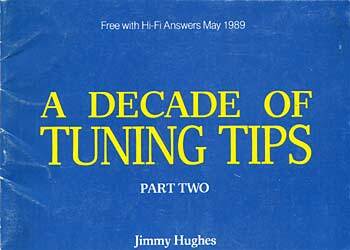 So, next time you are in a hifi shop that offers to sell you cable A for $100, or for even better results, cable B for $200, consider what they are saying. They are saying that they will charge you $100 for a cable which they know to actually damage the signal! Anyway, I suggested that the believers could make a handy $US1 million by participating in the James Randi Educational Foundation's Million Dollar Challenge. The usual response was made: a respected reviewer of equipment had tried to undertake the challenge, but they were unable to agree on a suitable protocol. Having returned, I've been checking this out. First, I am somewhat of an extreme sceptic (aka skeptic) myself about a wide range of matters including, obviously, many aspects of high fidelity. Second, Randi's foundation really does offer a million bucks. It has the money in the bank, ready to go. Third, I found a previously negotiated challenge on the Randi site which apparently fell through. 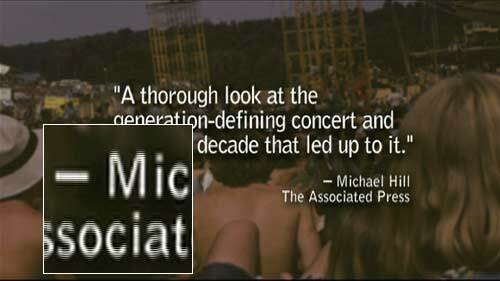 The whole sorry saga is laid out under 'MICHAEL ANDA, Audio Critic'. Two things stood out for me about this: the Randi representative was, I think, needlessly aggressive about the matter, while the Anda chap appeared to have an unusually high level of self-regard. It never got to the point of any actual listening. Fourth, I found an interesting blind test conducted outside the auspices of Randi's Million Dollar Challenge. This is well summarised in the first post on this thread, and the person who actually undertook the blind listening tests, Mike Lavigne, adds more detail in this post. In brief, the test was abandoned after seven valid trials. The results of trying to pick the cables: right, wrong, wrong, wrong, right, right, wrong. Apparently a seriously high-end system was employed. Lavigne felt very confident, before he donned the blindfold, that he could tell two sets of cables apart. He felt confident during the test that he was getting it right. But he wasn't. I have to admire this fellow's courage and integrity. Fifth, well known Stereophile reviewer Michael Fremer was on the verge of undertaking the Challenge, but the whole thing fell apart. In brief, the thing started with some snarky comments by Randi about Pear Cable's Anjou range of speaker cables. These cost $US7,250 for a 12 foot (approx four metres) pair. 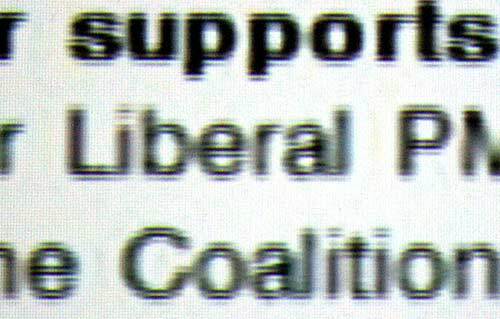 Apparently Pear Cable were initially keen to provide a loaner for the test. Fremer and Randi were both keen. But Pear pulled out. At those prices, it wasn't surprising that neither Fremer nor Randi were prepared to actually pay for them. Gizmodo has a useful, and fairly neutral (a least, with regard to Randi and Fremer), account of the matter. It lays the blame squarely on Pear Cable. According to Fremer, James Randi proclaimed on his website 'that the "blowhard" Fremer would never take the challenge, that the matter was closed, and that it was time to move on to the next challenger.' Fremer says he responded on Randi's forums and Randi eventually, kind of, retreated. At this point in the story, I was feeling pretty sorry for Fremer. I think he's probably wrong, and is most likely imagining any differences he claims to hear in cables, but that doesn't mean he's insincere, or a blowhard. I was thinking that Randi, after fifty years of exposing squirming 'psychics' and other practitioners of the paranormal, was getting a bit short tempered. At the request of Michael Fremer, with whom we have been communicating regarding his challenging of your assertions regarding high-end audio cables, we would like to inform you directly of Pear Cable's decision to not participate in your claimed challenge. Third � and most interesting � this retreat by Adam Blake effectively closes the current challenge, much to the relief of both Fremer and Blake, of course. Actually, I must admit that this was a rather clever way of squirming out of the huge dilemma in which these two blowhards found themselves. I think at the least both Fremer and Randi approached this in the beginning with good will. Fremer strongly believed that he would win the Challenge. Randi strongly believed he would not. Randi is highly suspicious of those who makes what he believes to be outlandish claims for the reasons outlined above, and over-reacted to a misinterpretation of the Blake letter. As to whether cables make a difference in sound, all of this goes to prove ... well, precisely nothing. Even the failure to notice a difference mentioned under 'Fourth' above doesn't prove anything. As correctly noted at certain places on that thread, the test failed to disclose any noticable differences by those participants alone in those conditions alone. I have in my possession copies of articles showing unblind, followed by blind, tests of sound. The unblind tests had marked differences noted. The blind ones had no differences noted. Same people, same equipment. There's a pattern here. People are convinced that there are differences. But every time they are put to a reasonably well conducted test, the differences disappear. This, in itself, proves nothing for the reasons already mentioned. Even more suggestive would be even one well-conducted double blind test of a controversial claim that went the other way; that showed that a difference could be discerned. If anyone knows of such a test, please let me know. Because until such a test becomes known, it would seem prudent to remain sceptical. I was in Japan last week as a guest of Yamaha Music. Had a great time. Ate dinner at the restaurant which inspired Tarantino for the restaurant fight in Kill Bill Part 1. Saw some interesting products. Yamaha has a truly superb home theatre room at its Hamamatsu headquarters, where it showed off its new RX-V2650 home theatre receiver and one of its new Blu-ray players (the latter seems to be based on Sharp hardware). Also had a tour of the whirlwind woodwind factory tour, and a somewhat slower one of the upright piano factory. More details in due course. A while back I did a 'Ten Best' piece on Blu-rays in Sound and Image. Best picture quality, best sound and so on. For Best BD-Live I put down Transformers on the basis of its downloadable 'Intelligence Mode'. As it happens, I go into this disc's BD-Live section a lot, primarily to check that BD-Live is working okay in whichever Blu-ray player I happen to be reviewing. The other day I noticed that there seemed to be more content in BD-Live for this disc than previously, and today I've had a proper look. Here's what's available now (obviously, quite a bit prompted by the sequel). I've copied the descriptions from the download area. The addition of all this stuff does lend weight to the 'Live' part of BD-Live. UPDATE (Thursday, 10 September 2009, Thursday, 10 September 2009): Unfortunately, the video (at least the one I checked), doesn't download for retention on your persistent storage, but is streamed. That means that every time you watch it, it will cost you bandwidth. Pity. Things like the Intelligence mode and Menubots remain in your persistent storage so you can use them any time you like.